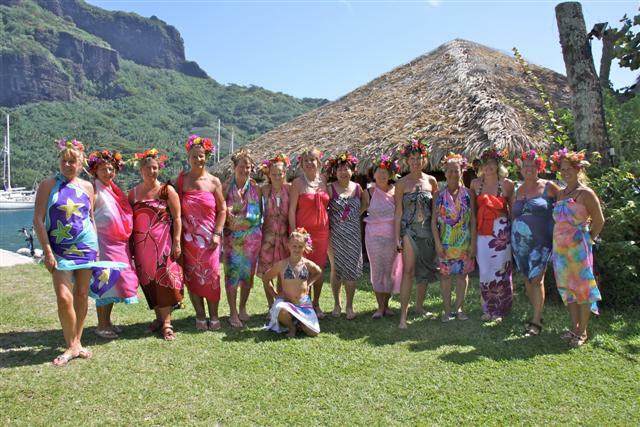 This is the story of our stopover in Tahiti and Moorea, the windward isles of the Society Islands. 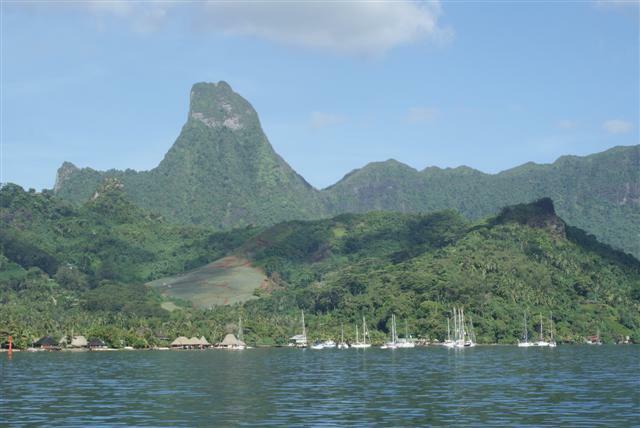 Tahiti is French Polynesia’s largest island and Papeete, it’s capital, was where the BWR made its base. We were moored next to the main boulevard alongside cruise liners and inter-island ferry boats. 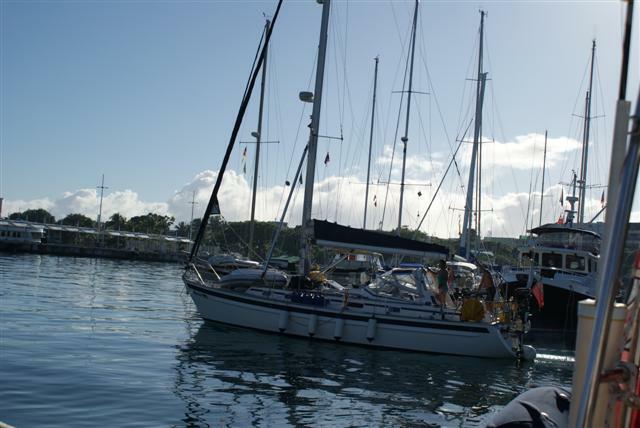 We arrived in Papeete in the dark at 1am on Monday 10th May. We managed to moor up ok with the help of other rally boats. The city beyond the waterfront is a jumble of colonial buildings, churches, small stores and modern shopping complexes with a backdrop of jagged volcanic slopes soaring into the clouds. Our first job, as always, was to sort out our customs and immigration entry, which took all morning. We then went for a nice lunch followed by the usual trail around chandleries to fix anything that’s dropped off on the journey. As we were alongside a pontoon for a change it was nice to be able to get the boat sorted out. 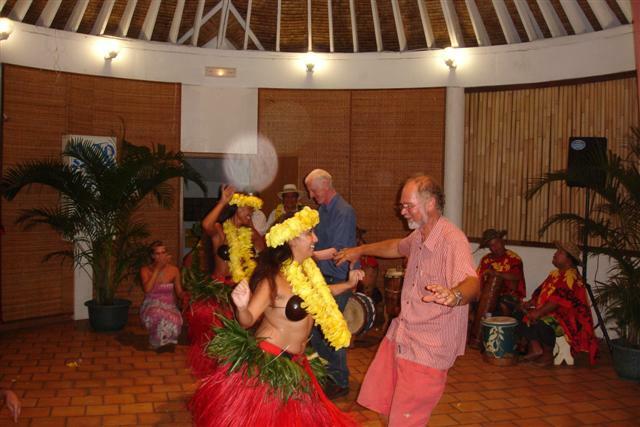 The following day we were entertained very well by the local tourist board with the presentation of leis in the afternoon followed by a delightful reception in the evening. 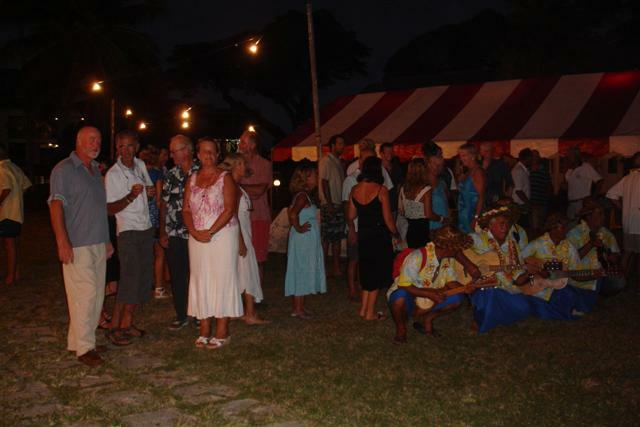 We were ‘summoned’ to attend by some Polynesian musicians and everyone followed ‘Pied Piper’ style through the town to the charming French colonial style city hall for a delicious buffet. 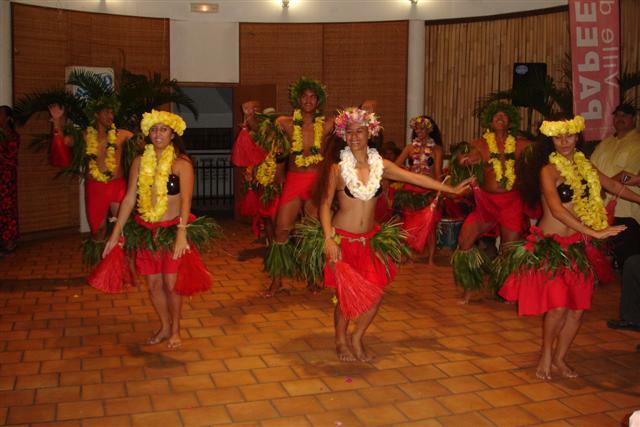 We were then treated to a wonderful display of Polynesian dancers performing some traditional dancing. Beautiful men and women performed dances that have been handed down through the generations. After their performance we were invited to join in. 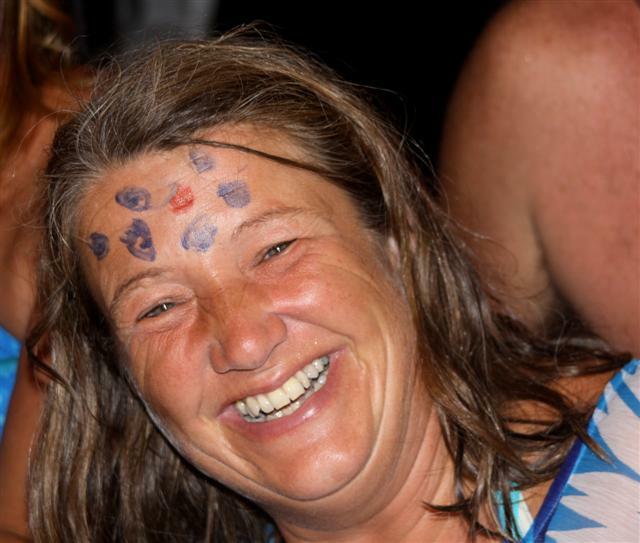 Some people really enjoyed themselves. This is our friend Ian from Lucy Alice showing off his dancing skills! The evening was rounded off with the presentation of beautiful engraved oyster shells to each of the boats. 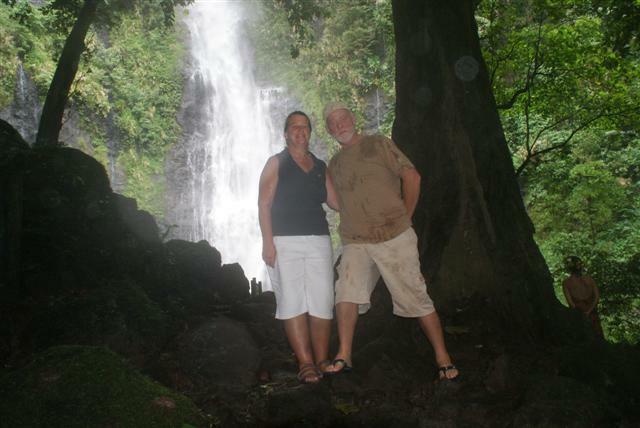 We continued around the island to the Faarumai waterfall. It was only a five-minute walk from the road and a very impressive sight. The rain continued but at least liquid sunshine was warm! We continued around the island to the Gauguin museum restaurant on the south side for lunch and then onto the museum. It features Paul Gauguin’s original work; paintings, sculptures and engravings, as well as documents, photographs and household items belonging to the famous artist. The gardens overlook the picturesque lagoon and the smaller island of Tahiti Iti in the distance. On the return journey the coach stopped at various places but the rain really started to hammer down. Our final stop was at the Marae Arahurahu, the most significant, and beautiful, ancient stone temple of the island. Unexceptional in its day, it was one of dozens of pre-christian shines. 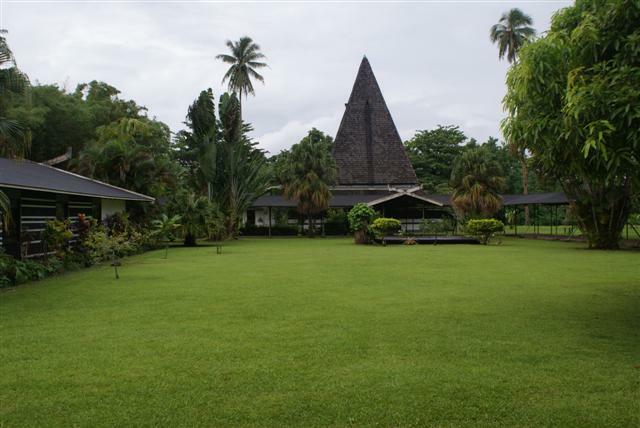 In modern times it was chosen for reconstruction to keep the memory of old Tahiti alive. It remains a magical setting, peaceful in the shadow of the mountains but sadly unexciting in the rain. We spent the next couple of days continuing the usual round of washing, shopping and boat maintenance. This included a visit to the colourful market in the centre of the town; a quintessential South Seas covered market, vivid with colour and commerce. Here they sell everything from straw bags to sticky desserts, from live pigs to bananas to fresh fish from the days catch and beautiful Heliconias. 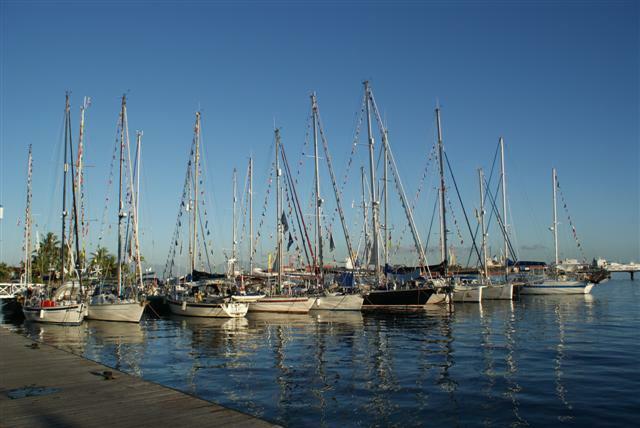 All the boats were tied to one jetty so on the last evening, which was a Friday, we had an impromptu pontoon party where we all brought a plate of food and we followed it with a heat of the Blue Water Master Millionaire challenge aka ‘Friday night is quiz night’. It was great fun, I organised the crews into teams, they had to think of an inventive name and each team was asked 10 questions. Although it was ‘just for fun’ some people took it seriously and some even dressed up, the vision of Stuart (Gaultine III) and Paul (Jackamy) dressed in sarongs and blue wigs will stay with us for a long time!! We had a really fun time and it ended with a tie between the ‘Tippyies’ and ‘Balibou’ (Bali Blue and Natibou). The following morning we all waved goodbye to Norsa as Norman and Sara were leaving the rally. 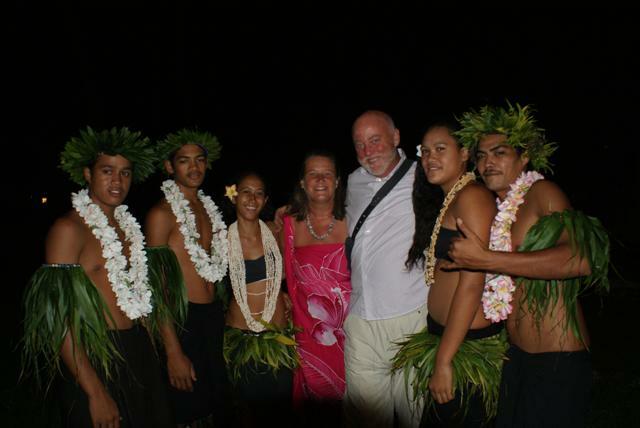 After our 5 day stay in Tahiti we checked out ready for our trip to Tahiti’s sister island of Moorea on Sunday morning. 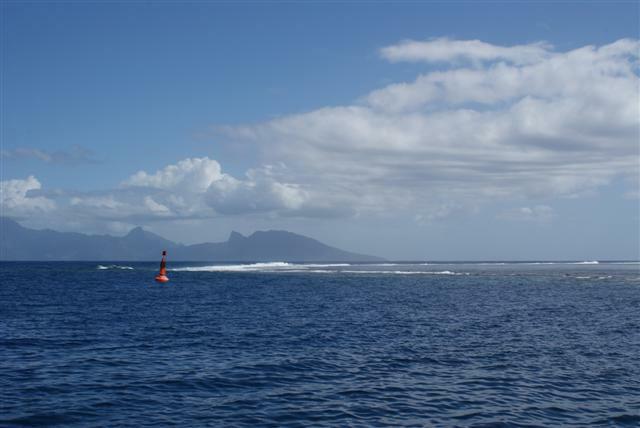 Although it’s only 12 miles from Papeete, we had a bit of a choppy crossing with some uncomfortable cross swells coming from the southeast and the north. We arrived in Cooks bay, Moorea just in time for Sunday lunchtime drinks, what perfect timing! Moorea is an island of volcanic origin and was populated by navigators who arrived in large double outrigger canoes from south east Asia 1000 years ago. 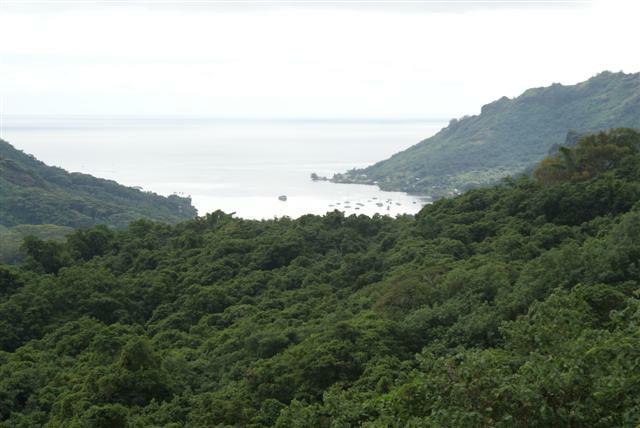 The first Europeans arrived during the 18th century, one of whom was Captain Cook in 1777, followers by the missionaries. The French Protectorate was established in 1842. 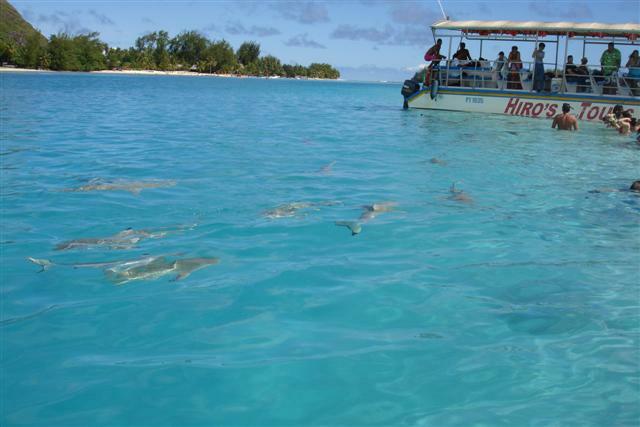 Moorea benefits from a beautiful turquoise lagoon that completely surrounds the island. Cook’s bay framed by lush green jagged mountains, which is dominated by Mt Rotui, the sacred mountain of the Ancient Polynesians, was our base for the next 5 days. We anchored next to the Club Bali Hai, a lovely resort that allowed us to use their pool and facilities. The next morning the ladies were invited over to the resort for a demonstration of how to make the beautiful Polynesian flower crowns, here is ‘Mama’ showing my friend Susan how it’s done. She also taught us how to tie a pareo properly. The pareo is the basic article of clothing for all Polynesians. It’s simply a large rectangle of printed cotton fabric. Both men and women wear it and it seems there are a thousand and one ways to tie it, even elegantly for the evening. ‘Mama’ taught us lots of different ways. It was a very interesting morning. As it was Susan’s birthday that day I made her a cake. Later Bill and I were invited on board Enchantress for a delicious meal. The girls in their crowns and pareos, I'm 4th from the left. The next day we were going to hire mopeds but it was raining so we stayed on the boat and did jobs instead. The following day we had a breakfast briefing for the next leg in the morning and then in the evening the hotel organised a delicious bbq followed by a spectacular dance show. We were able to show off our pareo tying skills again. After the show we all had our photos taken with the dancers. 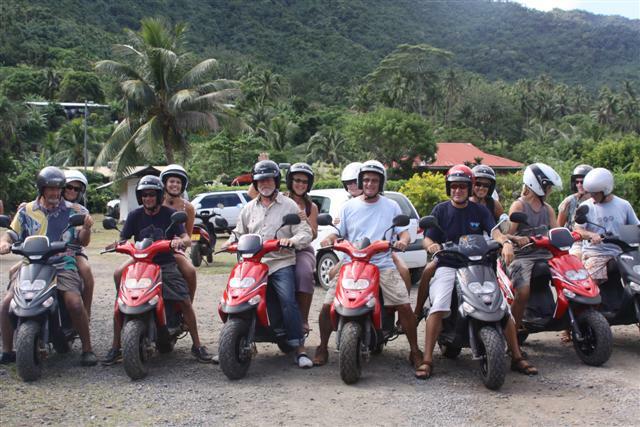 On the Thursday, despite the fact that it was forecast to rain again, a group of us decided to hire mopeds for the day. Bill and I haven’t been on anything like that for about 30 years but it was good fun. It took a while to get us all kitted out but finally we were ready to go. We called ourselves the Blue Water Angels. The circular road around the outside of the island is 62km so we could easily do it in a day. We set off around the edge of Cooks bay and then up to Belvedere view point which gives a spectacular panoramic view point over the two bays separated by Mt Rotui. We stopped at several archaeological sites (marae) on the way down – just as it started raining. 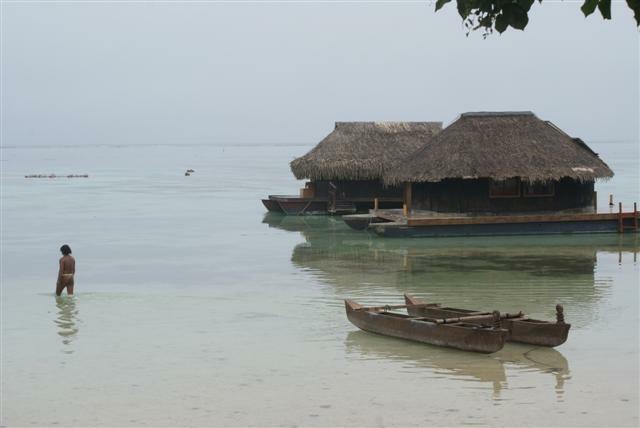 We continued around Opunohu bay with its thatched huts extending down to and beyond the water’s edge. 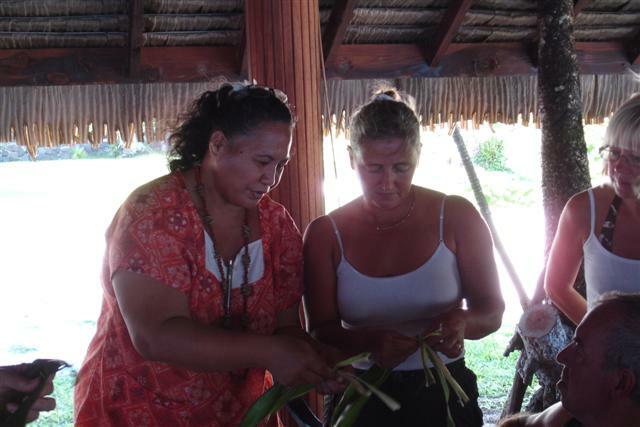 Most of Moorea’s 11,000 inhabitants live near the coast fishing or farming. There are no real towns only loosely knit settlements with a post office, a school, a church or two, and a general store trailing off into the next hamlet. We continued around anti clockwise until we came to the Tiki Village Theatre on the western side. Polynesians love to dance, sing and play music but most of all enjoy performing on stage. We decided to stop for some lunch, which meant we were entitled to watch the afternoon performance. They put on a great show including more ideas for tying the pareo. Afterwards we were invited to join in, we all had a great time. We had a look around the village in the afternoon before continuing on our way. 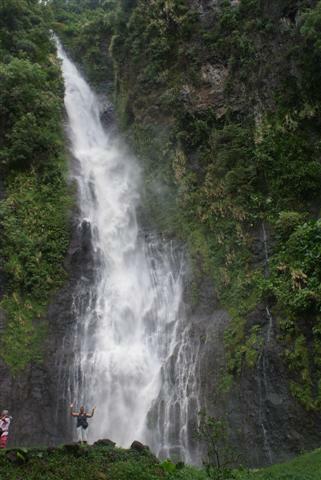 We had been told about a beautiful waterfall on the south side of the island. We found the track leading to it and the men decided to ride the mopeds up them. By this time the rain was coming down heavily and the track was very muddy. We left the bikes and walked some of the way but abandoned the idea after realising it was still a mile or two away. We had planned to stop at a beach for a swim but we just decided we wanted to go home because we were getting wetter and wetter. Although it was warm rain it was quite painful as it beat into our faces. We got back to the boats absolutely soaked. We stayed one more day to join in the 60th birthday party of Peter on Peregrina and then on the Saturday we lifted the anchor and motored around to Opunohu bay, the next bay along. The water was much clearer and we enjoyed some wonderful snorkelling over the reef. 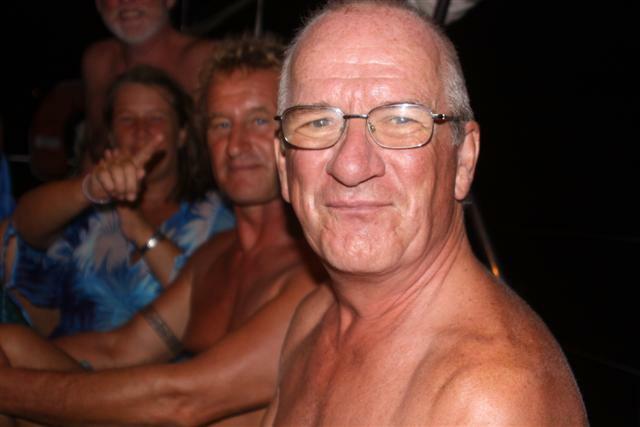 After our snorkel we joined the crews of Blue Magic, Miss Tippy, Jackamy and Bali Blue on board Chsalonina with our friends David and Susan and Fai Tira’s Pete. Paul on Jackamy is a very bad influence and suggested we play a drinking game called Cardinal Puff. This entailed you individually performing a sequence of hand movements while finishing your drink but if you got the sequence wrong your glass was topped up and you had to start again. I decided it looked easy and I was going to have a go! A half hour later having consumed a whole litre of wine I gave up but not before I was completely legless!! David decided he was going to have a go too and also failed. The dots on my face were from another game I don’t even remember playing but I obviously got it wrong!! Neither David or I could sit up and Bill had to take us back to the boats in our dinghy while towing Susan in theirs. I don’t remember a lot but There were a lot of sore heads in the morning!! The next day we dinghyed over to the other side of the bay because we had been told it’s possible to swim with rays and sharks. It was an amazing sight. 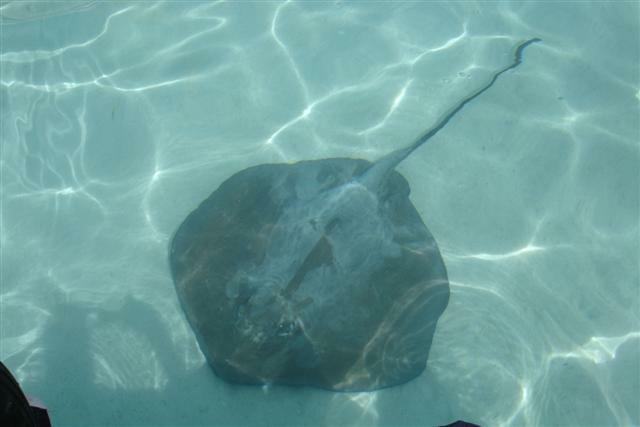 We got out of the dinghies and stood in the water up to our chest while several rays were swimming around our feet. There were also black tipped reef sharks too. It was possible to snorkel over a deeper area to see all the wildlife waiting to be fed. 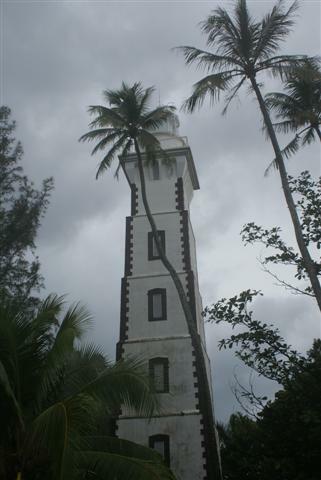 We had the place to ourselves for about an hour until the tourist boats arrived with the shark food … and the fish bait!! 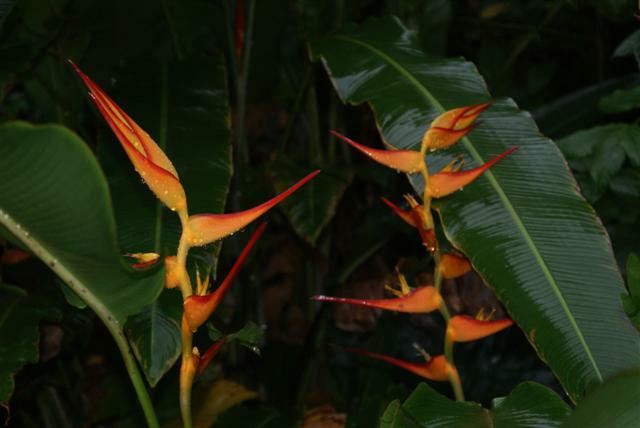 Posted on May 21, 2010, in Port posts. Bookmark the permalink. Leave a comment.